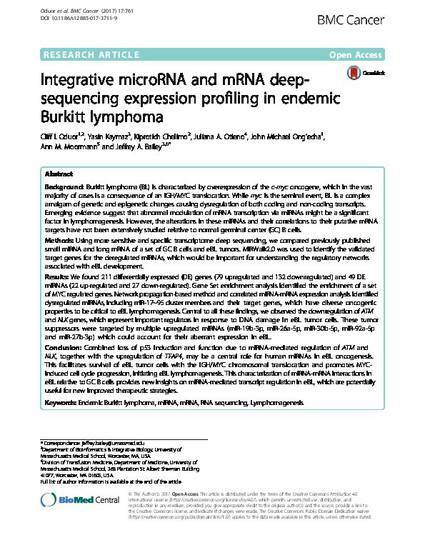 BACKGROUND: Burkitt lymphoma (BL) is characterized by overexpression of the c-myc oncogene, which in the vast majority of cases is a consequence of an IGH/MYC translocation. While myc is the seminal event, BL is a complex amalgam of genetic and epigenetic changes causing dysregulation of both coding and non-coding transcripts. Emerging evidence suggest that abnormal modulation of mRNA transcription via miRNAs might be a significant factor in lymphomagenesis. However, the alterations in these miRNAs and their correlations to their putative mRNA targets have not been extensively studied relative to normal germinal center (GC) B cells. METHODS: Using more sensitive and specific transcriptome deep sequencing, we compared previously published small miRNA and long mRNA of a set of GC B cells and eBL tumors. MiRWalk2.0 was used to identify the validated target genes for the deregulated miRNAs, which would be important for understanding the regulatory networks associated with eBL development. RESULTS: We found 211 differentially expressed (DE) genes (79 upregulated and 132 downregulated) and 49 DE miRNAs (22 up-regulated and 27 down-regulated). Gene Set enrichment analysis identified the enrichment of a set of MYC regulated genes. Network propagation-based method and correlated miRNA-mRNA expression analysis identified dysregulated miRNAs, including miR-17~95 cluster members and their target genes, which have diverse oncogenic properties to be critical to eBL lymphomagenesis. Central to all these findings, we observed the downregulation of ATM and NLK genes, which represent important regulators in response to DNA damage in eBL tumor cells. These tumor suppressors were targeted by multiple upregulated miRNAs (miR-19b-3p, miR-26a-5p, miR-30b-5p, miR-92a-5p and miR-27b-3p) which could account for their aberrant expression in eBL. CONCLUSION: Combined loss of p53 induction and function due to miRNA-mediated regulation of ATM and NLK, together with the upregulation of TFAP4, may be a central role for human miRNAs in eBL oncogenesis. This facilitates survival of eBL tumor cells with the IGH/MYC chromosomal translocation and promotes MYC-induced cell cycle progression, initiating eBL lymphomagenesis. This characterization of miRNA-mRNA interactions in eBL relative to GC B cells provides new insights on miRNA-mediated transcript regulation in eBL, which are potentially useful for new improved therapeutic strategies.